The Keeshond (pronounced KAYZ-hawnd) is a double-coated breed. This coat consists of a woolly undercoat and a longer guard coat. The undercoat is a pale gray or cream color and the outer guard hairs are a mixture of gray and black with black tips. Twice a year, Keeshonden “blow,” or shed their undercoats completely. This intense shedding period can last up to three weeks. Keeshonden appear larger than they really are because of their full, thick coat. 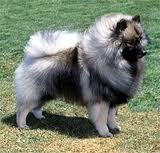 The average height of a mature Keeshond (over 2 years old) is 17″ for females and 18″ for males. The weight is ideally between 36 and 40 pounds. Except during the time of shedding, the keeshond coat is fairly easy to care for. Daily brushing is ideal, but once or twice per week will help to keep the coat clean and remove any loose undercoat. In addition to their beautiful coats, Keeshonden are recognized for their alert, smiling expression and the distinctive “spectacles,” which are lightly shaded lines slanting upward from the outer portion of the eye to the lower corner of the ears. The keeshond is friendly by nature to both people and other dogs. Their demand for affection is high, and they prefer to be included with the family rather than be left outside on their own. Keeshonden both bark and “talk.” The alert keeshond barks a warning that a stranger is near, but rarely are they nuisance barkers. Rarely are they nuisance barkers, but they will bark a warning that a stranger is near. A keeshond is most happy if allowed to live in the home with the family, his “pack.” The ideal situation, of course, is one in which the dog can come in and out of the house on its own, through a dog door. The original Keeshond probably descended from the same arctic strains that produced the samoyed, spitz and Norwegian elkhound. The dog’s gentleness and devotion suggest that he was never intended as a hunting dog, but rather as a companion.